The Kavanaugh hearings. Priest abuse. More celebrities accused of harassment. Cosby. It has been tough for us grown-ups. Angry debates. Politicians behaving badly. Celebrities we once adored betraying our admiration. And heck, if you can't trust priests, who can you trust? Regardless of your political views (and this is not meant as a political post), the endless news about Kavanaugh and Christine Blasey Ford has evoked long-buried memories of abuse and assault for many women (and also some men). It also reminded some of threatening situations where they escaped unscathed, but were left with that bitter taste of fear entrenched in their psyche. They never told anyone, but their world view and ability to trust were forever changed. Even if you think Ford was lying, her description of the alleged assault, and the fear, shame, and worry that one would not be believed, is a classic example of what typically occurs during and after an assault. As a psychologist, I have seen this countless times - acute, clear memories of faces, sounds, voices, smells, certain images in the room, but no memories of details such as an address or times of day. And as tough as these few weeks have been for us adults, as much as the news may have evoked our own memories, stoked arguments among family, or created worries about our country's future, this reality may be even more distressing for our children. A little over a year ago, I wrote a blog post about helping children cope with a distressing national event. And now, we face another one. All children old enough to have some awareness of the news may be affected by it - but gifted children, with their often heightened sensitivity, tendency toward overthinking, concerns with fairness and justice, and ability to appreciate life's complexities - may be particularly troubled. Our children need our help. 1. Consider your child's developmental and emotional level. A young, elementary school-aged child requires a different explanation than an adolescent. Younger children need simple, reassuring explanations. "Some people who run the country got into an argument, and a lot of people are upset, but they will work it out." "There are some people who made a movie and were mean to some of the actors. They were fired for being mean and hurting them." Acknowledge that something is going on out there, but their world is safe. On the other hand, gifted teens, in particular, will resent any sugar-coating or downplaying what they observe. They often welcome a frank, open-ended discussion where their opinions are valued. Provide an open, safe, and non-judgmental environment where they can express their concerns, fears, anger, and questions. Offer your opinions, values and advice when appropriate, and don't criticize their differing views (as long as such views are not harmful to them or others). 2. Find out what your child already knows. Gathering information allows you to understand your child's perspective, gives you a base to start from, and lets you clarify any misunderstandings. You might ask, "What is your opinion about the Kavanaugh hearings?" or "What are your thoughts about the celebrities charged with harassment?" His comments will give you an idea of the depth and complexity of his impressions, interest in the topics, and any emotional reactions. 3. Get a sense of how your child is feeling. Try to evaluate how distressed your child might feel about the news. She might hide her reactions with a snarky bravado or outright dismissal of any concerns. But with some gentle questioning, you might learn a little more. Don't push too much, but you could always let her know of your availability and concern. "Have you been upset about what is going on in the news? A lot of people are bothered by it, and if it gets to you now - or later - please let me know. We always can talk about it." If she seems upset, angry, confused or anxious, or is displaying symptoms of distress, such as difficulty sleeping or a loss of appetite, use this conversation as an opportunity to explore her feelings and let her know you are concerned about her. 4. Help your teen make sense of the news. This might seem difficult, but gifted adolescents, in particular, usually grasp ambiguity and complexity. If your teen is furious about an opposing political party, try to help him understand that those he opposes are real people who also love their families and mean well - even if you strongly disagree with their views. If you agree with Trump about economic policy, for example, but are angry about comments such as "grabbing women by the p...y," you might note that sometimes even powerful adults make statements they shouldn't, that you hope your child will learn from this, treat others respectfully, and use common sense before he speaks. If he asks why priests would abuse children, you may have to again, invoke your gifted child's ability to appreciate the complexity of human nature, and point out that although people can be quite learned and devout, they also can be emotionally disturbed and engage in terrible behavior. 5. Use this as a teaching moment. This painful time in our nation's history can be used as an opportunity and a teaching moment. Use this as a chance to repeat lessons you have already taught your children, whether it is "good touch, bad touch" or "no means no" or even just about trusting their instincts when a situation seems unsafe. Remind them about the importance of respecting their body, their boundaries, their right to say no, their preferences, and the option to always reach out to you if they need help. It is also a time to remind them to respect the boundaries of others as well, which includes withstanding any peer pressure that might result in harm to others, such as bullying or hazing. 6. Help your child feel safe. 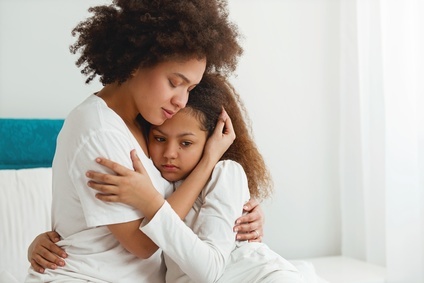 Remind your child that you will do whatever is possible to keep her safe. While internet debates compare "free-range" and "helicopter" parenting, there is a middle ground that involves a healthy appreciation for your child's age and capabilities, the community where you live, and what comprises a reasonable level of parental involvement. Protect her from age-inappropriate situations, people whom you think are not safe (e.g, that relative whom you never fully trusted, the babysitter who seems a bit too immature), and role-play how to handle difficult communications, so she has the words to defend herself. This includes your caring (and sometimes "annoying") lessons about safety, boundaries, and how to handle herself at parties, events, concerts, friends' homes and even walking home from school. She may complain and roll her eyes, but she will hear you. Let her know she can come to you with any question or concern, and that you will try to help her sort out what is best. As we recover from the past few weeks - personally, as families and as a country - hopefully, we can learn from this, and raise our children to be compassionate, caring, and respectful adults. And if you or your child are struggling with memories of abuse, please seek counseling with a licensed mental health professional who specializes in trauma. A similar version of this article was published on Medium. Thank you, Gail. I've been trying to figure out how to write about this, too. You make some very helpful points. Appreciate your sensitivity and courage. Thanks so much, Paula. Trying to be politically neutral in this polarizing time is not easy! But the glaring issue is the emotional reaction this brings up for so many related to sexual assault and safety. Thank you again for your support.